Microsoft said it has been working closely with industry partners to move Microsoft Defender ATP to non-windows devices for a while now, leading to the development of a Mac version. A limited preview of the Microsoft Defender ATP Mac app will be available to businesses. 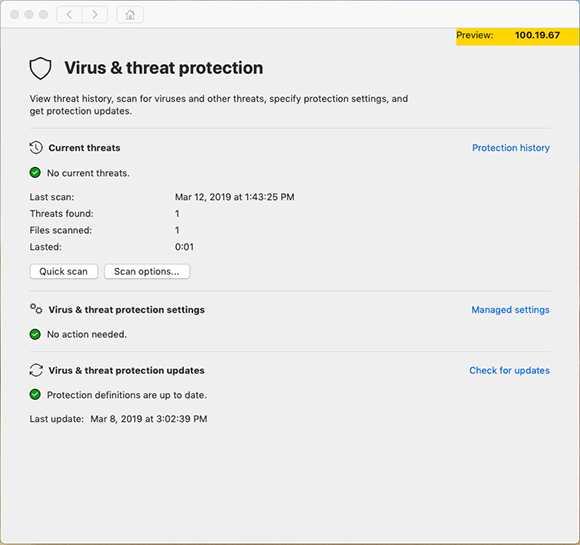 It provides the usual next-gen protection against malware while also offering different types of scans, threat reviews, and actions against said threats. Most of these features are configurable, so you can set the program up however you like. Mac users need to download the installer from Microsoft—it isn’t available through the App Store. It will be available on devices running macOS Mojave, macOS High Sierra, or macOS Sierra. While Defender is part of Windows, there’s no mention of a consumer version for Macs. Microsoft is selecting a small group to take part in the preview. Existing Microsoft Defender ATP business users with one or more macOS computers can sign up here.